At Zacks Eye Clinic in central London we see several patients with presbyopia who benefit greatly from multifocal contact lenses. Multifocal contact lenses are designed to provide clear vision at all distances, eliminating the requirement for distance and reading glasses in presbyopia. Some multifocal contact lenses have a bifocal design with two distinct lens powers — one for distance vision and one for near vision. Others have a multifocal design, somewhat like progressive glasses, with a gradual change in the lens power from distance to intermediate to near vision. A wide range of multifocal contact lenses are available from disposable lenses to extremely complex tailor made multifocal contact lenses. 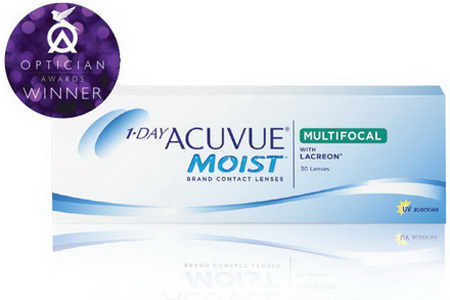 Soft multifocal contact lenses are very comfortable, so they’re great for full time or occasional wear. There are several soft multifocal contact lens designs available in daily disposable, monthly disposable and tailor made options, to suit most prescriptions. One-day disposable soft multifocal lenses reduce the hassle of contact lens care as well as the risk of allergies and infection. Most soft multifocal contact lenses are based on the principle of simultaneous vision whereby multiple lens powers are placed within the pupil at the same time. Light both from the distant and near portions of the contact lens are focused onto the retina simultaneously to provide clear vision at all distances. Rigid gas permeable multifocal contact lenses (RGP’s) are made of rigid plastics that transmit oxygen making them easy to handle and very durable. They offer excellent health benefits because they don’t dehydrate, and are less likely than soft contact lenses to harbour bacteria. Since they retain their shape, rigid gas permeable multifocal contact lenses usually provide sharper vision than soft multifocal contact lenses. Though because of their rigid structure, gas permeable contact lenses require some adaptation, becoming more comfortable with regular wear. Rigid Gas permeable multifocal contact lenses come in a variety of lens designs to provide excellent optical quality to even the most complex prescriptions. Most RGP multifocal designs rely on a concentric arrangement, like that used in soft multifocal contact lenses whereby the distance prescription and near prescription are viewed simultaneously. Other designs rely on translating segments whereby the contact lens is moved over the eye to change from the distance to near prescription. Rigid Gas permeable multifocal contact lenses are made to order and prescribed to the precise curvature, diameter, and corrective power to suit your eyes. Even the size of the distance and near portions on the contact lens can be tailored to your specific requirements. Hybrid multifocal contact lenses provide the visual benefits of a hard multifocal contact lens, with the comfort of a soft multifocal contact lens. Multifocal hybrid contact lenses rely on a concentric arrangement and can provide an excellent option for patients with high prescriptions or complex requirements. Scleral multifocal contact lenses are very large rigid gas permeable contact lenses that rest on the sclera providing a very, stable optical surface. Scleral contact lenses are often used to provide excellent vision and comfort for people with ocular surface disorders such as keratoconus and severe dry eye disease as well as for patients with high prescriptions. For more information on multifocal contact lenses or to find which type of contact lenses would be most suitable for your eyes, please get in touch to make an appointment for a consultation at our London practice.